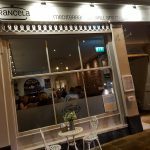 We had been planning on visiting the Francela Mediterranean Grill & Mezze Restaurant weeks ago but the nasty fire that closed the Cycle Shop and the Pub Restaurant next door probably slowed our decision to make our first visit and I am sure it must have had an effect on a few others. We had some super recommendations about the restaurant from friends and family and they weren’t wrong. We booked for 6.30 Saturday evening, just the two of us this time, so romantic! 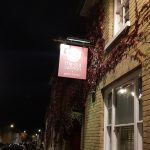 The restaurant is ideally situated in the centre of Bury St Edmunds on the corner of Angel Hill opposite the War Memorial. There is easy access to the restaurant with ample opportunity for parking close by. We were greeted by the friendly attentive staff as soon as we arrived. This isn’t a big restaurant but very cosy, and with about 50 covers it was filling up quickly. 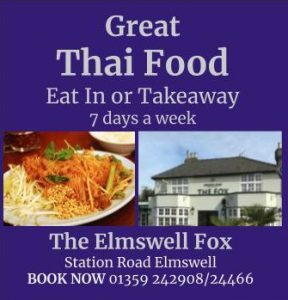 With two sittings on Saturdays if you go in as early as we did they do expect you be finished in a couple of hours but certainly do not make you feel uncomfortable or rushed, far from it. 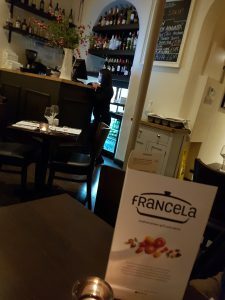 There is a real Mediterranean feel to the restaurant that takes you back to holidays past and as the restaurant fills up there is a really happy homely atmosphere that is created by the staff. Initially I was confused into thinking because of the Kirmizi Biber and the Sucuk on the menu that it was a mainly Turkish influenced menu but then when they started playing ZORBA the GREEK as background music I was even more confused. I did ask the waitress who pointed me in the right direction “definitely The Med”, she said but with Belgium Chocolate Cheesecake on the menu I did start to question the merit of my GCE in geography. 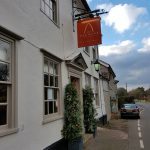 With 5 different beers on the menu plus Aspall Suffolk cider and a Rekorderlig Pear cider the bottle price ranges between £4.50 to £6.20, the pricing is very close to other restaurants in the area and provides a decent choice. No Real Ale though. The wine menu is interesting offering a real choice from Italy, Spain, Turkey, Australia, New Zealand, Argentina, and Chile. The cheapest bottles of Red are an Italian Merlot or Montepulciano at £16.95 whilst the Amarone Classic also from Italy is a tasty £55. The Whites are headed up by Pinot Grigio or a Sauvignon Blanc also at £16.95. The Prosecco at £21.95 seems to be good value. Gladys and I both went for a glass of wine which we both really enjoyed, myself a glass of Italian Merlot at £4.95 and Gladys a glass of Pinot Grigio Blush, a Rose from Italy also £4.95 both were available in a larger version for £6.60. The choice from the main menu was quite exciting and a real choice by comparison to some other restaurants around. 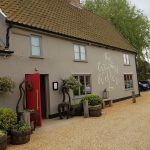 There is also a lunch and early evening Menu which offers real value at £14.95 for two courses. There is an excellent choice of Mezze Appertisers both cold and hot and a choice of five salad dishes. The Main Course choice is Lamb, Chicken and Fish served up in various ways Chargrilled, Casserole or Marinated with peppers and mesclun salad. For our Starters Gladys ordered the Kirmizi Biber, chargrilled red sweet peppers stuffed with feta cheese, oriental herbs served with bread and salad, a great plate priced at £6.25. I had the Garlic Shrimps, pan fried shrimps with garlic and oriental herbs served with salad and bread to mop up the garlic sauce. This was priced at £8.95. For our main course I ordered the Kefte at £15.50, spiced lamb meat balls with oriental spices served with a mesclun salad and cracked wheat. 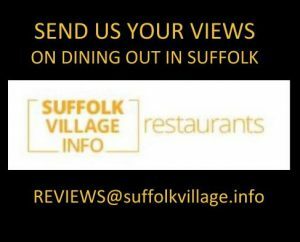 Gladys ordered the “New on The Menu” Lamb Al Funghi at £16.95, marinated lamb with mushroom and a creamy sauce served with mesclun salad and cracked wheat. 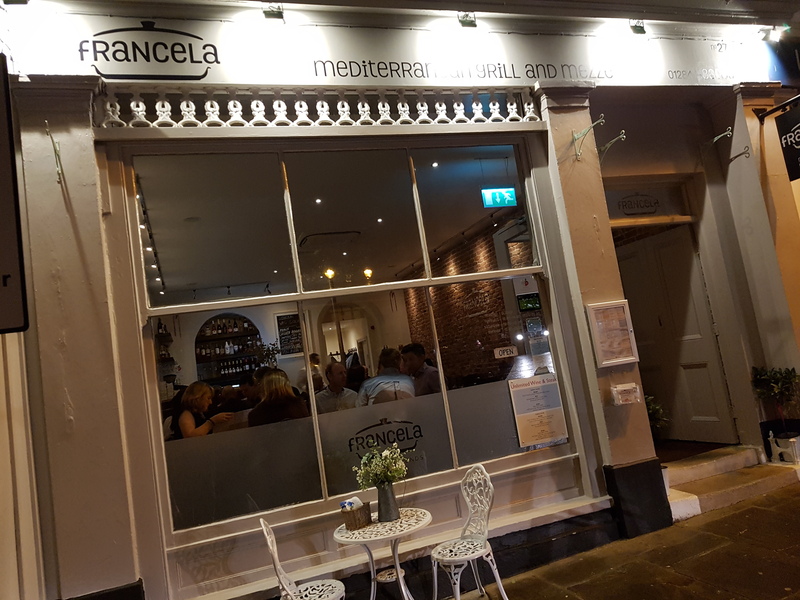 Both the starters and main courses were excellent really tasty good sized portions and true value for money we really enjoyed the authentic “Tastes of the Mediterranean”. There was a good choice of Desserts on the menu but truthfully we were stuffed and couldn’t eat another thing. I did manage another glass of Merlot though. The bill came to a very reasonable £62.50 plus the manager gave us each a shot of Amaretto, which is always a nice touch. 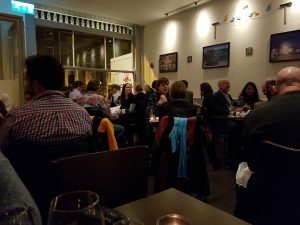 The restaurant was now full and the atmosphere in the room creating a real buzz of an international holiday flavour. 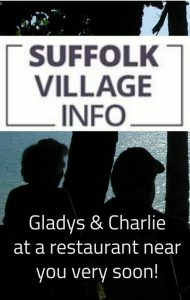 Coupled with excellent service given with a smile it really was a lovely night out in West Suffolk for Gladys and Charlie and we are definitely going back. 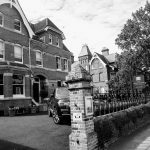 One small but important note however was that our original booking was done via their website, we didn’t get confirmation of the booking so we thought we would give them a call to see if they had picked up the booking … and they hadn’t.